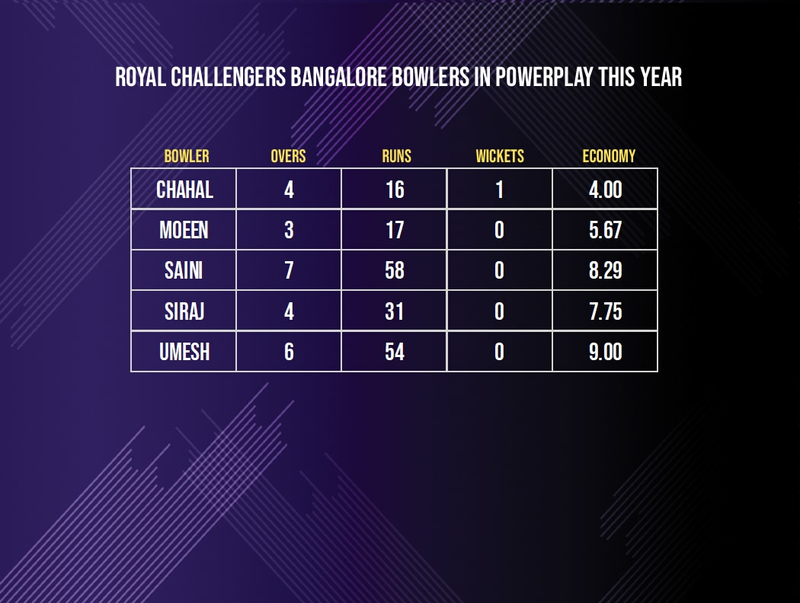 Last year, the only positive the Royal Challengers Bangalore* could perhaps take from the season was the performance of their bowlers in the powerplay overs. In the 14 matches they played, RCB picked 25 wickets and had the joint-best strike rate in the season in the first six overs (roughly a wicket every 20th ball). However, this year even that seems to be have gone haywire. We are four games into IPL XII and RCB's powerplay bowling has already come under scrutiny. In the first match against Chennai Super Kings, on a slow, turning and crumbling surface, defending less than 75 runs, RCB resorted to spin and conceded just 16 runs while picking up a wicket in the powerplay. Since then, though, things have gone downhill for them. And how! In the remaining three matches they have gone for over 50 runs while picking up no wickets in the powerplay-phase. 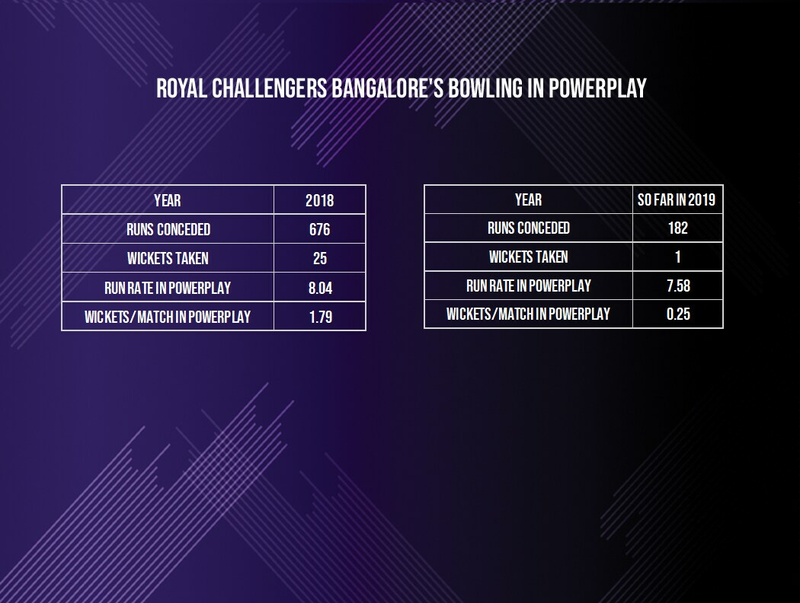 So far in the season, RCB have gone for 182 runs in the powerplay in four matches but have been able to account for just 1 wicket – that is how poor they have been. This gives them an economy of 7.58 in the first six overs (largely due to the low-scoring first game) and a wickets/match (W/M) of 0.25. The W/M in the powerplay last season was an impressive 1.79. The run rate was higher at 8.04 but if we keep aside the Chennai game, then this year RCB have gone at 9.22 in the first six overs. Kohli used all pace in the first six overs but this goes against conventional thinking for his most successful bowlers in the powerplay this season have been spinners. Both, Yuzvendra Chahal and Moeen Ali have gone at less than six runs per over whereas the pacers have all conceded above 7. What stands out here are Umesh Yadav's numbers. The seamer was a standout performer for RCB last season in the first six overs. He took 14 wickets at an economy of 6.74, the most wickets by any bowler in the first six overs in the season. This year, though, after four games, Umesh has gone for 54 runs in the six overs he has bowled in the powerplay-phase while not picking up a single wicket. The ineffectiveness up front of the bowlers to pick wickets and to restrict the flow of runs has been one of the primary reasons the RCB find themselves at the bottom of the points table – 4 matches and 4 losses. Time is running out for the Challengers. *All statistics from before the RCB vs KKR game on Friday (April 5).